We Make Pasta | Sprezzatura, Y'all! Everyone comes to Italy with a wish list of things they want to see and do, and Myra was no different. Besides the wonderful art, medieval cities, Renaissance towns, ancient monuments, and incredible food, Myra wanted to see an Italian garden, take a pasta making lesson, and see an opera. She’s been here less than a week and we’ve done two of those things. We’re working on the opera. 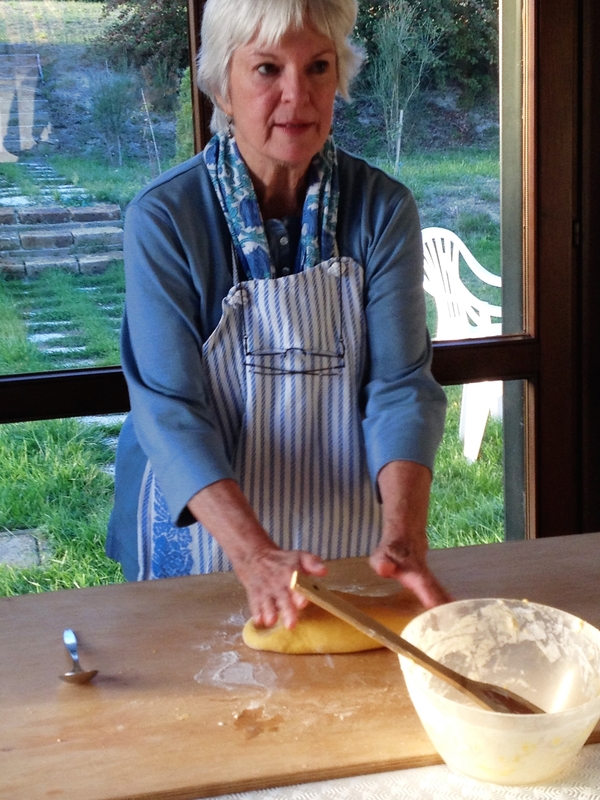 Michelangelo’s wife, Rosella, offered to give us a pasta making lesson. So off we went to their house for our authentic Italian pasta making class. 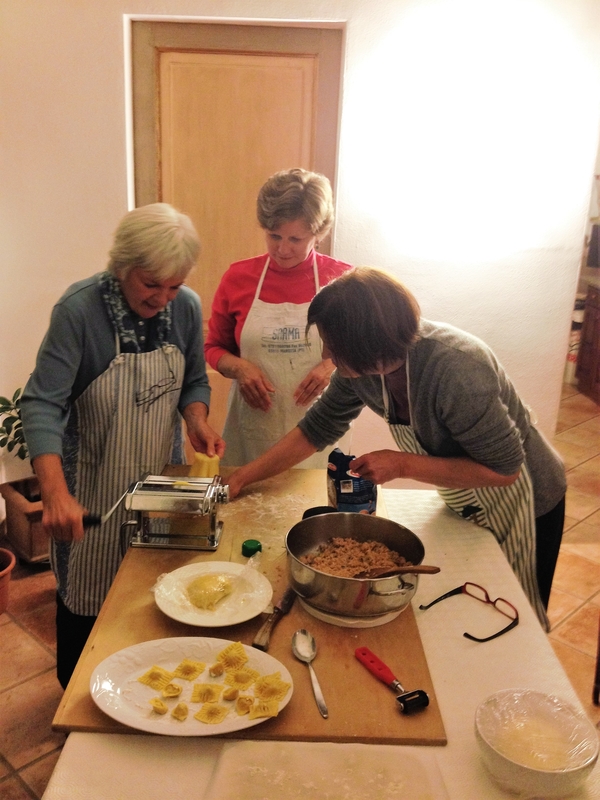 As with all things Italian, the pasta making class was just the starting point. There was much, much more to this evening. No simple tagliatelle with tomato sauce for us. We arrived at 4:30 and Rosella was in the kitchen starting the filling for the agnolotti (the filled pasta that we would be making). It was celery, onion, and carrot, veal, chicken, sausage, and pork. It cooked while we were making the pasta and then was put through a food grinder until it was very fine. Rosella made the pasta making look so simple. Just flour (“00″) and egg. That’s it. 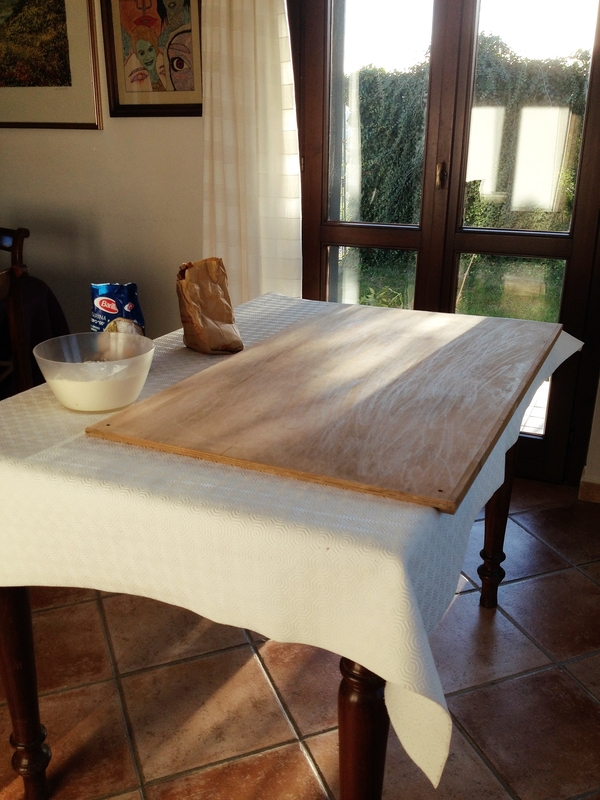 But the way she worked the dough and brought it together was the magic. She gave us both a turn at kneading it, but she knew just when it was time to stop. I’ve tried to make pasta before – I even have a pasta machine. I know just enough about it to appreciate the wide variety available to me in the market and be thankful that there are people in the world who make it and package it for me to eat. You really have to know what you’re doing and to know that you need practice. And advice from a pro. That’s what we were getting. 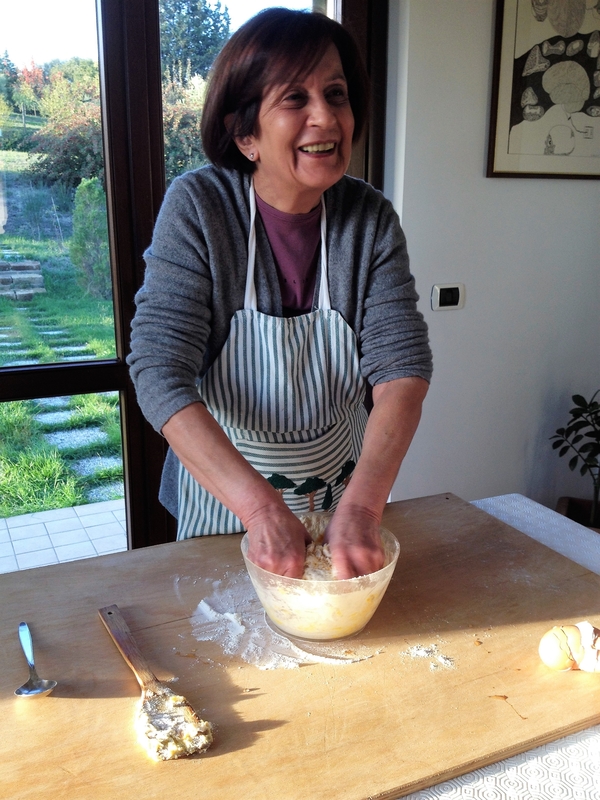 A lesson from a real live Italian who’s been making pasta all her life. She knows her stuff. We probably kneaded about 15 minutes or so until our teacher pronounced it done. Then we finished the filling and started rolling the pasta. All the recipes I’ve read say to run the pasta through the roller two or three times. Rosella looked at me like I had a second head when I asked her about that. No, just once, but you have to figure out the correct number to roll it through. We settled on 5. And the rolling, shaping and stuffing began. And went on and on and on. 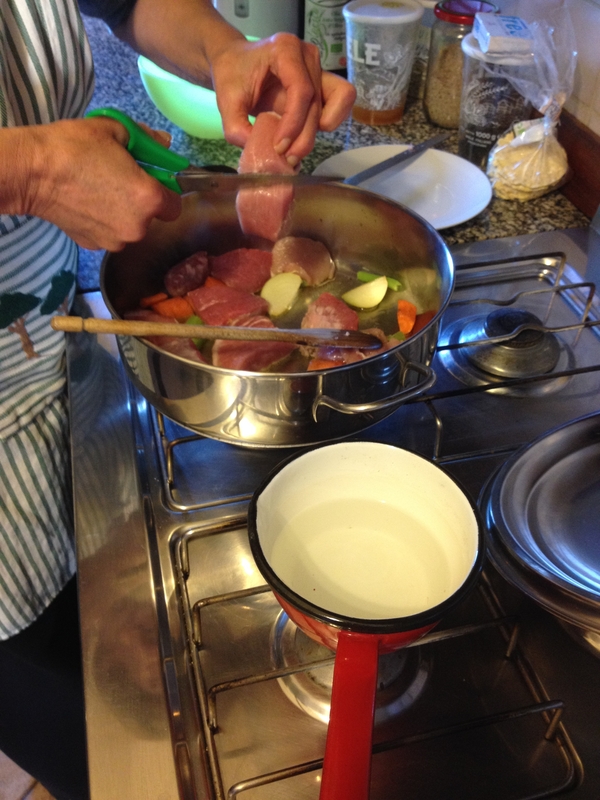 She showed us how to make cappelletti (little hats – very traditional at Christmas) and agnolotti. We cut the rolled out dough for the agnolotti with an espresso cup. For the cappelletti she had a rolling cutter that cut the little squares. Rolling, cutting and filling pasta takes a long time. 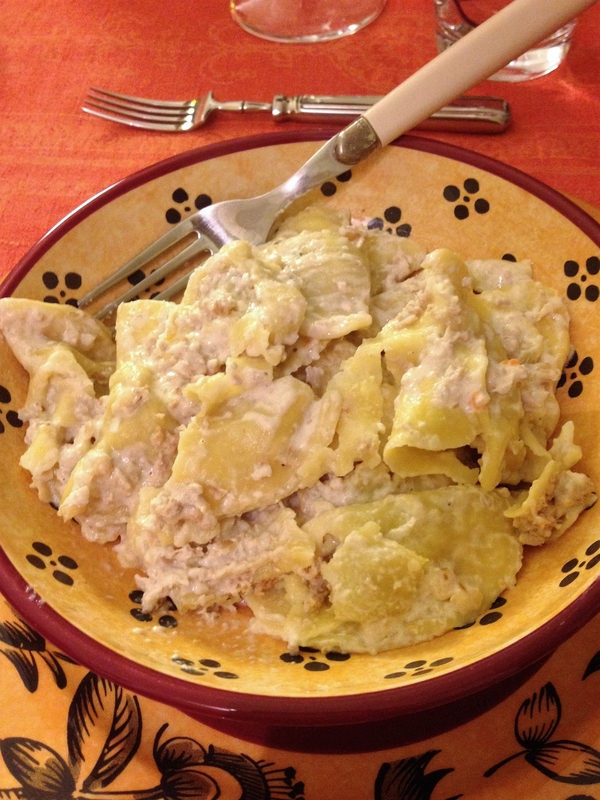 It was well into the evening when we finally finished the last agnolotti. Then a quick cook and the pasta was done. But Rosella wasn’t. The homemade pasta with the homemade filling wasn’t quite enough, so she made a sauce of cream and walnuts, just to gild the lily a bit. Some of our agnolotti exploded, but all in all I think we did a pretty good job for our first official effort. But there was more. Grilled sausages, mashed cauliflower and potatoes, bread and dessert. And just when we thought we couldn’t eat anymore – roasted chestnuts. We left very full and very satisfied with our pasta making knowledge. And with a new understanding of why fresh, hand made pasta costs so much. Lots of labor, but in this case, lots of fun. Sounds like a perfect evening.Did Steve get to eat with you all?I probably know the answer. You know he did! He “helped”, but mostly ate. Was a wonderful evening. Aaahhhhh looks so wonderful. I’m insanely jealous of this pasta making lesson y’all had. What a treat. Hi to Myra. It’s been too long. Myra says yes, it has been too long and the pasta lesson was great. Debbie, you would love it here and would absolutely love the way they look at food and cooking. We’ll try to do you proud! When we get back we’ll teach you how to make pasta. Myra looks possessed as she kneads her pasta! Love it. What a lot of worthwhile work. Makes me smile. You had to be possessed! It was work but well worth it. We learned a lot and we ate a lot! All in all a good evening.